Some kitchens require a drastic change. We had one client that requested just that. 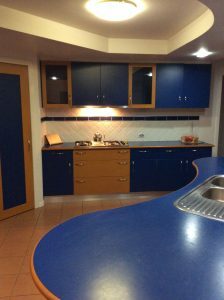 When they sat down with Craftbuilt Kitchens, they wanted our designers to keep the basic footprint of the kitchen area that had worked for the family for so many years. 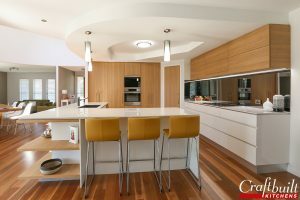 In addition to that, the clients required to lighten the area and still have room for interesting design and finish elements to complement the “quirky” architectural scheme of the home. This is where the drastic change comes in. 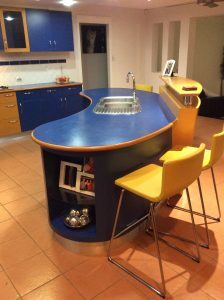 Gone are the 70’s style dark colours and curves that were so predominant in the old kitchen. These were quickly disposed of to make room for a modern-style large kitchen. 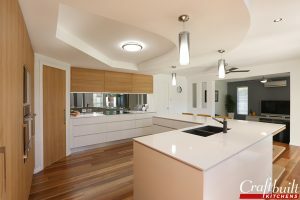 In its place, is a high gloss white finish with a textured timber grain feature that ensured the new kitchen would provide a light and spacious feel while still achieving a warmth and texture that satisfied the client’s desire for a tactile element. 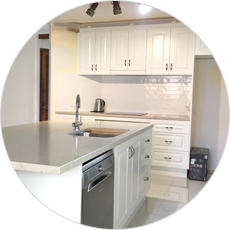 A handle-less finish along with an undermount square sink neatly recessed in the low profile stone benchtops, ensures sleek, streamlined dimensions, finished with a discreet shadowline. Take note of the mirrored splashback. It provides an interesting touch to the area that jives with the stainless steel appliance finish. For storage, internal pull outs in the new pantry, along with a fit out to their existing walk-in pantry, significantly increased pantry space. Rear cabinets on the back of one side of the new L-shaped island bench combined with many sets of drawers meant so much extra, easily-accessible storage ensuring they would never need to worry about having enough kitchen storage. Amazing how the light wood flat-panel cabinets can provide maximum storage! 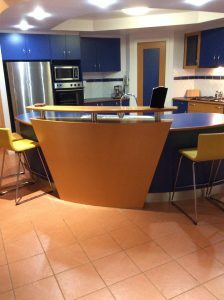 The engineered quartz L-shaped island bench is perfect for the busy area and guests, family members are automatically drawn to the center of the kitchen. 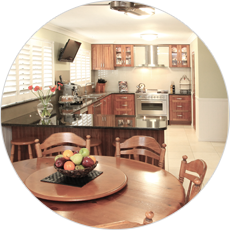 Lastly, gone are the old kitchen tiles and in its place is a smooth medium hardwood flooring. Such a fantastic end result! 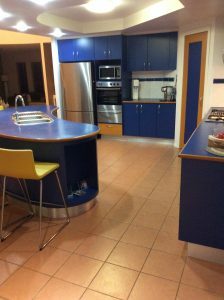 A wonderful new Craftbuilt Kitchen for the family to the great room! 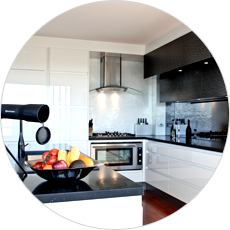 Are you ready to design your new kitchen with us? 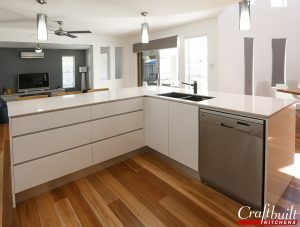 Contact our Craftbuilt Kitchens designers at (07) 3341 9166 to book an appointment at our Underwood showroom or visit us at our new Kitchen Design Studio at Unit 15, 76 Old Cleveland Road,Stones Corner QLD 4120. See you there! 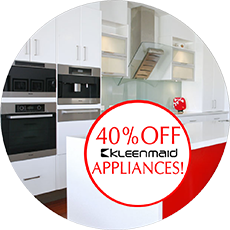 Energy Efficient Natural Light in Your Modern Kitchen Discounts On Kitchen Appliances – SALE This July!